Hurricane Jet-Vac was the greatest, most daring flying ace in all of Windham. He was given his magical wings when he was young, as was the tradition for all Sky Barons. But when his homeland was raided, he chose to sacrifice his wings to a young mother so she could fly her children to safety. 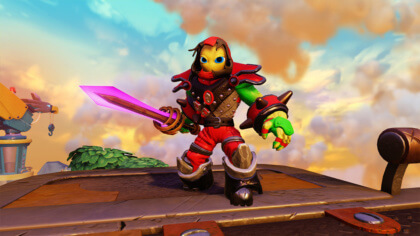 This act of nobility caught the attention of Master Eon, who sought out the young Sky Baron and presented him with a gift – a powerful vacuum device that would allow him to soar through the skies once again. 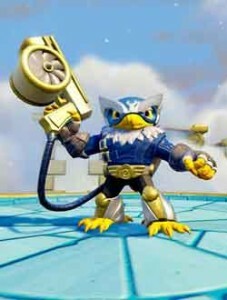 Jet-Vac accepted the gift with gratitude, and now daringly fights evil alongside the other Skylanders. Jet Stream is a finely tuned storm-chasing machine. Its twin turbines give it supreme maneuverability, while its Sky Baron battle armour and enhanced weaponry guarantee it will always be the last bird standing!